The final Saturday of July actually saw rain - shock, horror. Not to worry though, passenger numbers were still encouraging and it was nice to see the Jinty back out on the trains. No doubt they were pleased it was cooler too! Down the yard, work continued on the Class 73 with the windows being put back in. TSO 4440 had welding work now it has been put into the Maintenance Facility. The LMSCA were also working in the TO and the team furthered The Duke in the shed. I'm sure Tim will fill you in more on this. This evening saw a private Wedding Anniversary DMU charter for a couple from Wirksworth and 60 of their guests. It featured fish and chips at Duffield and the sun finally came out for this! Another scorching hot day again in Wirksworth which started with a passing thunderstorm but soon turned out sunny again. It was an average Friday on the trains boosted by a coach party on the last train who also enjoyed tea and sandwiches upon their return. A vacuum fault which had developed on the three car DMU was rectified quickly ready for a charter tomorrow evening. The Jinty was warmed through ready for it to return to service tomorrow after missing last weekend. 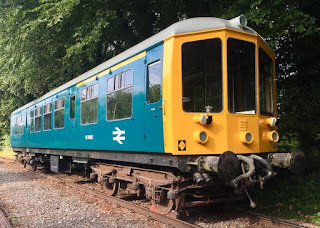 At the end of the day, the Derby Lightweight trailer car was shunted out of the shed sporting a fresh new blue livery. There is still quite a long way to go with the restoration of both cars both mechanically and internally but it has really brightened it up in the meantime. I fairly average day on the trains today but not surprising given the heat. It topped 33 degrees at Wirksworth Station this afternoon. Nevertheless some groups continued despite the heat. It was good to hear that Henry Ellison passed it's internal boiler test and should hopefully, pending a steam test, be back in service after a while out of action. The S&T department were down at Shottle with further work taking place on Oddingley box. The bottom timbers are being cut out as they are rotten and need replacing. Another lovely summers day which featured the WyvernRail AGM. Unfortunately, visitors weren't able to sample steam services though due to a problem with the locomotive whilst it was being prepared in the morning, which meant that 31206 did the honours. People still seemed to enjoy their trip but hopefully the Jinty will be repaired soon. Down the yard, there was quite alot happening on the loco fleet as the Diesel Gala approaches. The Class 73 received more fettling including proper testing of the exhausters and also testing of the multiple working with the Class 33, which does work! It was great to see them as a pair moving up and down and it was quite amusing to talk through the loudaphone to the other loco. Class 08 605 was receiving routing maintenance of the rods and axle boxes including new pads and general lubrication. This enabled a loaded test run to be carried out in the evening which was successful. 31 601 had further work too, including work to the entry step boards. Not quite as busy as yesterday but that has been following the recent Friday pattern. It was boosted by a small party this morning who also enjoyed afternoon tea in the Station Café after their journey. Down the yard, a lighting issue on the 3 car set was rectified and also work on the EVRA BSK continued as this coach grows closer to service. A reasonable day on the trains with 33103 "Swordfish" at the helm, fresh back from a trip to Lancashire. An at-capacity tea train boosted things too. Down the yard, fitters constructed a new work bench. Maintenance work was carried out on the steam fleet ready for the weekend too. Theres always a hive of activity on a Tuesday. The afternoon shift arrived to look at this pesky power fault with the Class 73 which is preventing it from driving under its own power. Having had the air frame rebuilt and the cab put back together hopefully it won't be too long before it can run. Hopefully for the August gala! Attached is a photo of the cab desk which looks wonderful. 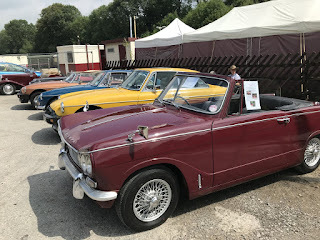 Back to the glorious sunny and warm weather for day 1 of our Classic Transport Weekend where an assortment of classic road vehicles congregate at Wirksworth Station. There were classic trains too in the form of both our 1958 Class 101 DMU and the 1926 Jinty with 1950s Mark 1 coaches. All was smooth and went well with lots of happy people, including a coach party from Wales. Down the yard, the Class 73 had work to reconstruct the air frame and the red 08 (605) was having an underneath traction motor exam. These events take a lot of staff to put on so thank you to all of those who helped. Antiques in the Streets alongside our event tomorrow for anybody that is interested! Before the services began running today 31206 tripped a tank wagon to Duffield in preparation for this weekend's special event. They were back in plenty of time for services to begin. It wasn't quite as busy as yesterday but with a special event looming, it isn't surprising. The Maintenance Team then turned their attention to the 3 car DMU ready for tomorrow. 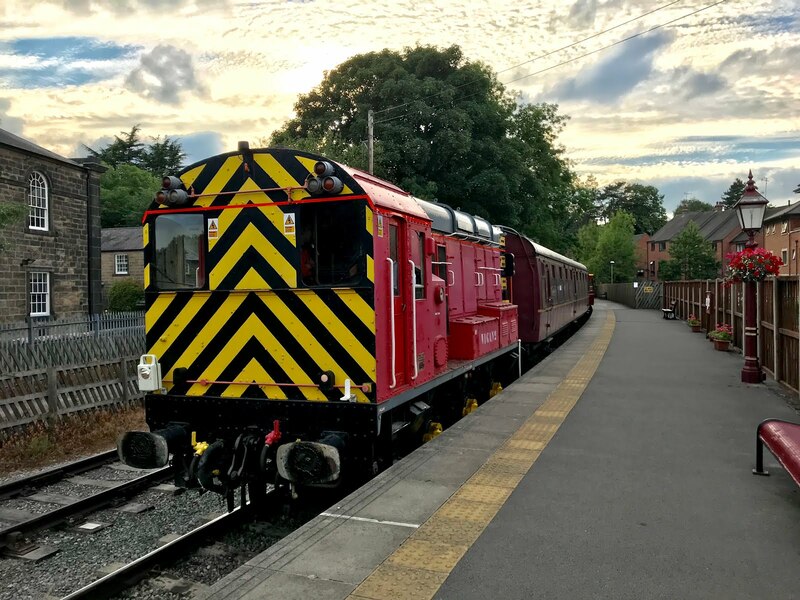 Later in the day, the Class 33 'expert' arrived to trace a fault which developed last weekend whilst the locomotive was away on holiday to ensure it is good for service on Tuesday. A hive of activity around the place with plenty of activity in the MyTestTrack department. Firstly a line clearance machine was on test on the Ravenstor incline and the people testing the Blackpool tram were in attendance too. In between all of this the Class 73 was repositioned for work to continue this weekend. The train service was reasonable today with many people enjoying Iris. It is, of course, not as busy as the weekend but it was still well worth doing. Down the line, the S&T department were working on the refurbishment of the former Oddingley box, cutting out the bottom 3" of rotten timbers ready for replacement. An average steam day today with Iris covering the Ravenstor line due to a problem with No3 this morning. Pre-booked guests enjoyed a lovely Ploughman's Lunch on board the train with Pimms and lemonade. Everybody seemed to enjoy their meal in the dining car. 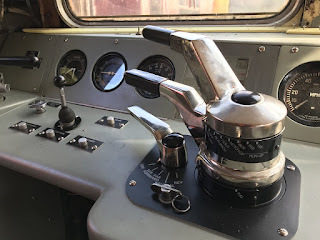 Down the yard, work continued on the Derby Lightweight running gear and the recently arrived Ferryvan was cleaned out so that it is ready for use. The Steam Team worked on No3 after the problem this morning and hopefully it is sorted pending a steam test in the week. Another lovely summery day in the valley with steam running on both lines. We didn't have high hopes for today with half of the country watching a certain football match but happily it was reasonable. A party of 4 had prebooked for tea on the train which doubled after some other visitors saw it all laid out as the train pulled in. I'm sure theres some news from the other end of the yard as well but as I was on the desk all day, I didn't see what was going on! A reasonable midweek DMU service ran today. There were also certainly plenty of phone calls and other enquiries to help things along their way too. We welcomed two vehicles today and of course, they had to arrive together. One is the return of the Blackpool tram for further testing and another is a ferryvan wagon seemingly rescued from Peterborough and will be most useful for storage. That is once they've unloaded it as the absence of a ramp means it isn't likely to be down until the weekend. The 108 had further work done on the throttles and also an investigation into work needing to take place on the corridor connection. A boiling hot day in the valley for our Annual Classic Bus and Coach Rally. We had two trains running today, both a DMU and the Jinty passing each other. We had many happy passengers who also enjoyed rides on some of the vintage buses too. It was busy generally inbetween dealing with two totally unrelated stray dogs during the day! Down the yard, work continued on TSO 4440 and the Class 73 had further painting and work done on the air frame. Work on the vacuum and other systems continued on 08605 too. I had an interesting discussion about this heatwave recently and its impact upon visitor numbers. Do people really want to sit in hot, stuffy railway compartments with no air conditioning rather than be out in the sun, topping up their tans or enjoying a dip in a pool? That said we enjoyed reasonable visitor numbers today who could enjoy a trip down the beautiful valley under cloudless blue skies. Passenger numbers were bolstered by two pre-booked parties who were ably looked after by our catering team. As I have mentioned before, we must acknowledge the dedication and hard work of our operational team in such hot weather. It is unbearabley hot on the footplate on days like today and our catering team kept both steam crews suitably hydrated together with our on train team who ensured the passengers too had a ready supply of refreshments. My thanks to today's visiting crew from the GCR who ensured the Duffield service ran to time and to Richard and the crew on 'Brian Harrison' who ran numerous trips to Ravenstor in conjunction with Richard's yard tours. Today's service was supported by the EVRA shop, miniature railway and booking office staff.